Postcards From The Smokies » Where Have I Seen That Before? If viewing the above photo gives you a sense of deja vu, you probably saw the 1993 movie “The Fugitive” in which Dr. Richard Kimball (Harrison Ford) eludes capture by Deputy Marshall Samuel Garard (Tommy Lee Jones) by jumping off a high dam. 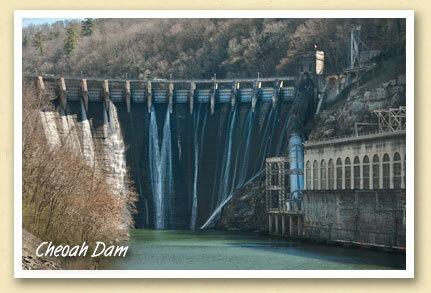 The scene was filmed at Cheoah Dam in the western tip of Swain County. Almost all of the escape sequences were shot in the Bryson City area, including the dramatic train wreck which was staged on the Great Smoky Mountain Railroad near Dillsboro. Remnants of the ‘wreck’ remain along the tracks and can be seen on the Railroad’s Bryson City to Dillsboro excursions.